Poseidon is a family-owned and operated business that has been in the Transport Refrigeration industry for over 38 years. We have been building truck bodies and fitting out vans for all types of applications. 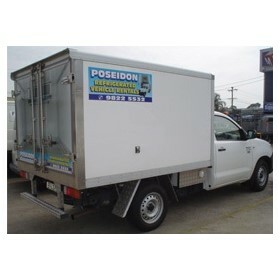 We also repair truck bodies and vans for insurance or private, with no job too small. Poseidon Transport Refrigeration is highly recognised by all major insurance companies and can also supply all brands of refrigeration units on request. We use quality products in construction taking no shortcuts and comply with all aspects of government requirements including health departments, meat authorities, HACCP, and ADRs. Our Modern Fleet of Vehicles range from a cool +4 to a freezing -20, with 240 volt electric standby systems and reverse cameras. Poseidon Transport refrigeration strives to go the extra mile to ensure our clients receive a quality product and competitively priced prompt and efficient service.